RCM-1204CTS has all servo motors, 4 heads, 12 needles, 1000 spm, auto trim, 5-inch LCD display, thread break detection. Ricoma RCM-1204CTS 12-Needle 4-Head All Servo Motor Tubular Embroidery Machine. Expand your business and increase your production capacity with RiCOMA’s multi head tubular machines with all Servo Motors. Available in 2, 4, 6, 8 heads and up. Linear guide rail and servo motors ensure higher production efficiency,lower noise and less heating. Multi-languages available,such as English, Portuguese, Spanish, French, Dutch, Turkish, German, and more. Steel bridge structure,more stable and less vibration. 5 inch LCD shows the real embroidery status. Internet with computer makes the design transfer more convenient and fast. Multiple noise reduction developments help create a quiet and pleasant working environment. 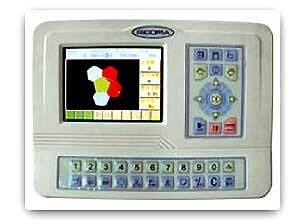 Ricoma RCM-1204CTS Compact Control Panel. Ricoma RCM-1204CTS Frames / Hoops Included. Ricoma RCM-1204CTS Cap Attachment Included. 270° Wide Cap Driver, 1 set for each machine. 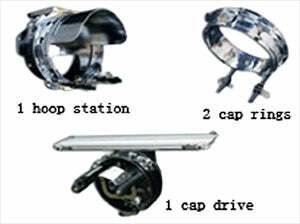 Cap Frames, 2 sets for each head. Snap in and Snap out Cap Change Device, 1 set for each machine.